We do not object to you linking directly to pages on this site. We reserve the right to move or change our website URLs at any time. You may use and re-use the information on this website (not including case studies, logos or photographs) unless that information is identified as another party’s copyright, free of charge in any format or medium. We encourage users to establish hypertext links to this website. If you wish to copy logos, images or videos from the NHS North West Leadership Academy website or any of our online channels, you must contact us for further guidance and authorisation. To use case studies, please contact our communications team as third party permission may be required. The permission to reproduce material does not extend to the material on this site which is identified as being the copyright of a third party or for any photographic images. Authorisation to reproduce such material must be obtained from the copyright holders concerned. The names, images and logos identifying the NHS North West Leadership Academy are proprietary marks. If you wish to copy or use our logo, you must get prior approval from the NHS North West Leadership Academy’s branding team. If permission is granted, you will also be provided with guidance on using our branding. These guidelines must be adhered to. RSS feeds: Our RSS feeds can be used as part of your website however we do require that proper format and attribution are used. The attribution text should read ‘NHS North West Leadership Academy RSS feeds’. We reserve the right to prevent the distribution of NHS North West Leadership Academy RSS feed content and do not accept any liability for these feeds. Social bookmarking: Use of our social bookmarking links is subject to the general Terms and Conditions of this site, see ‘Linking from the NHS North West Leadership Academy website’. The NHS North West Leadership Academy website and material relating to information, products and services (or to third party information, products and services), is provided ‘as is’, without any representation or endorsement made and without warranty of any kind whether express or implied, including but not limited to the implied warranties of satisfactory quality, fitness for a particular purpose, non-infringement, compatibility, security and accuracy. We do not warrant that the functions contained in the material contained in this site will be uninterrupted or error free, that defects will be corrected, or that this site or the server that makes it available are free of viruses or represent the full functionality, accuracy, reliability of the materials. In no event will we be liable for any loss or damage including, without limitation, indirect or consequential loss or damage, or any loss or damages whatsoever arising from use or loss of use of data or profits arising out of or in connection with the use of the NHS North West Leadership Academy website. Although we may from time to time monitor or review discussions, chat, postings, transmissions, bulletin boards and the like on this NHS North West Leadership Academy website, we are under no obligation to do so and assume no responsibility or liability arising from the content of any such locations nor for any error, omission, infringement, defamation, obscenity, or inaccuracy contained in any information within such locations on this NHS North West Leadership Academy website. We may revise these terms and conditions without notice. Please check regularly. 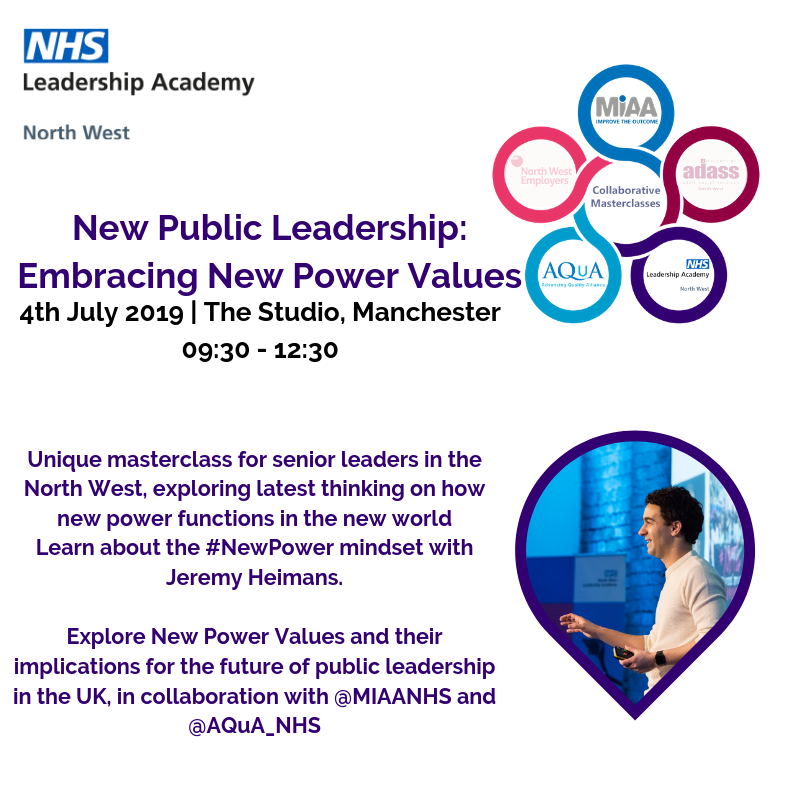 Continued use of the NHS North West Leadership Academy website after a change has been made is your acceptance of the change. This privacy statement only covers this NHS North West Leadership Academy website. It does not cover all sites that can be linked to from this site, so you should always be aware when you are moving to another site and read the privacy statement on that site.